“Star Wars: The Last Jedi” has garnered both praise from critics who lauded its departure from the franchise’s formula, and ire from long-time fans who say it missed the mark. Chief among the complaints, beyond the unbalanced pacing and needless subplots, concerned the movie’s heavy-handed progressive messaging. To that end, an anonymous user—a troll with too much time on their hands—created a 47-minute cut of the film with its female presence drastically cut down. It’s a hundred minutes shorter than the actual movie, the cut is as linear as a bad dream and it focuses entirely on its male characters without any of the character development given to Rey—one of the The Last Jedi’s finer elements. Called “The Last Jedi: De-Feminized Fanedit (aka The Chauvinist Cut),” the cut-down version is clearly intended to satirize the complaints about the movie’s heavy focus on Finn’s aimless sidekick, Rose (who’s referred to as “Asian chick” and “China girl), and the pink-haired admiral played by Laura Dern. Most of their scenes, along with Leia’s and Rey’s, are significantly reduced. The Kylo Ren and Rey battle sequence is also re-edited to de-emphasize Rey’s martial prowess. Despite having every indication of being a work of satire, the cut has sparked a backlash from the progressive media who are lamenting what they see as an insurgence of men’s rights activists in the geek community. On Fast Company, Joe Berkowitz called the edit the “James Damore cut,” referencing the maligned Google engineer who was fired for publishing a memo questioning the company’s diversity initiatives. Over on Twitter, Dragon Age writer David Gaider complained that the edit made him physically sick. 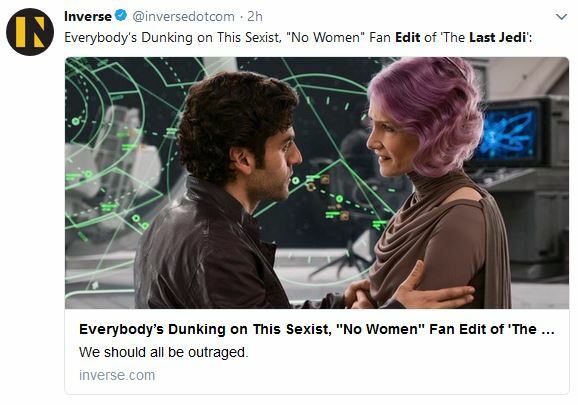 His views were echoed by Polygon and CBR comic book critic Kieran Shiach, who “observed” that removing all of the strong women from the movie would cause the First Order to win—never mind that the good guys still win in the fan edit. BuzzFeed editor Miriam Elder proposed banning men from the next Star Wars episode in response to the edit. The Last Jedi’s own director, Rian Johnson, laughed at the edit. It was one of the few sane responses buried within an avalanche of outrage. Everyone complaining about it should take a cue from Johnson.